Almost every part of a pumpkin is edible ‒ even the flowers. Although your kids may not get too excited about eating pumpkin flowers, you can cook other parts of this big orange squash. Try freshly roasted pumpkin seeds, a pumpkin pie, pumpkin waffles, or pumpkin chili. Fresh pumpkin purée is easy to make and less expensive than the canned variety. Just slice your pumpkin in half and scoop out the inside. (Save the seeds to bake later.) Bake the pumpkin in the oven for 90 minutes, in a pan filled with approximately one cup of water. After baked and cooled, purée the pumpkin in a food processor or blender. You can use the puree for recipes now or you can freeze it for the future. In addition to the tried-and-true jack-o-lantern, get creative with your designs. Decorate pumpkins with glitter or markers, or create a funny character by dressing up your pumpkins. An old straw hat and denim suspenders are perfect for concocting a pumpkin scarecrow. For the perfect autumn feeding spot for feathered friends, build a pumpkin bird feeder by cutting off the top of a pumpkin, poking a few holes in the sides, and filling with seed. Hang outdoors in a place accessible to birds but not other creatures. Have you tried any of these popular uses for pumpkins? 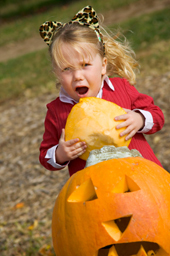 Do you have your own favorite pumpkin tricks? Let us know!